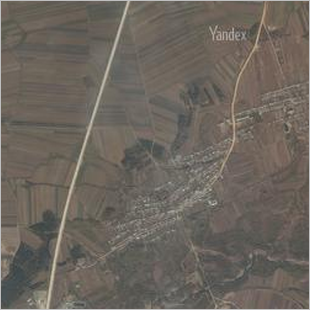 Yandex.Maps and Yandex Map Editor are built based on satellite images of Earth. 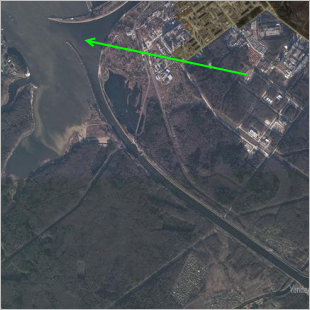 This section describes the most important characteristics of satellite images and geographic features for drawing purposes. 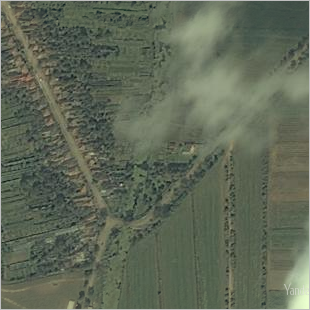 Satellite images have different levels of detail. 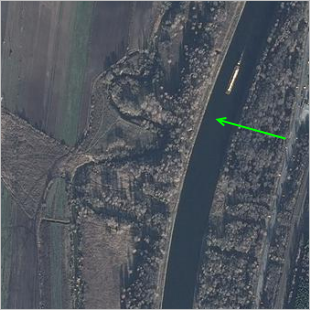 On some of them the motorways and buildings are clearly visible (as in the left part of the image) and in others only major map items like lakes are distinguishable even when the map is zoomed-in as far as possible (as in the right part of the image). 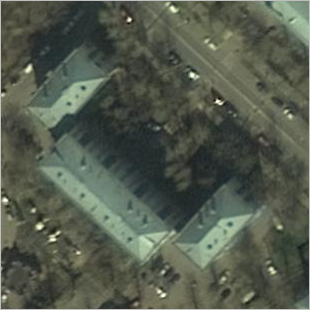 You should only plot items whose shape can be determined by the satellite image available. 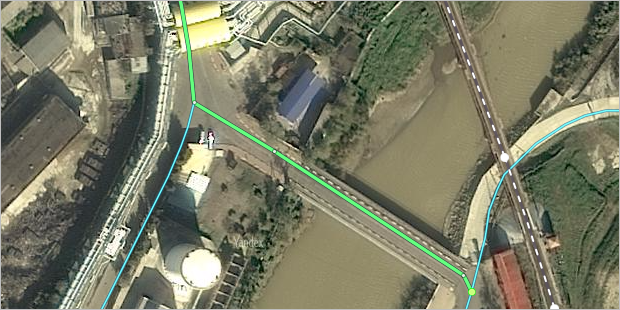 Rivers, main roads, and localities can be drawn even if the image is not very detailed. 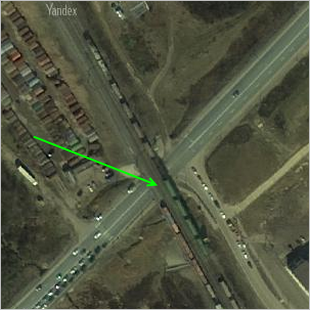 If you want to draw small items (small roads, including pedestrian lanes, individual buildings, etc. 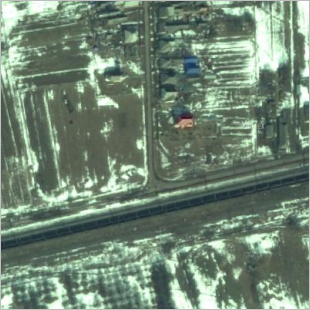 ), it's better to wait until a detailed satellite image is available. 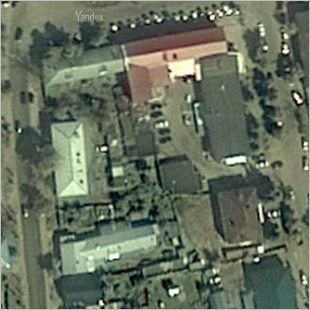 Images are taken from space regularly. 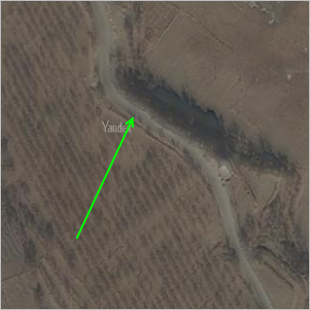 Satellite coverage on Yandex.Maps is constantly updating: less-detailed images are replaced with detailed ones and outdated ones are replaced with new ones. 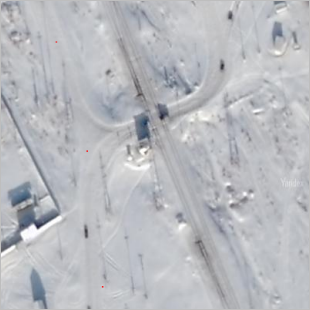 Sometimes there is a discrepancy between the new and old satellite image, so map items don't line up with the new one (as in the image on the left). 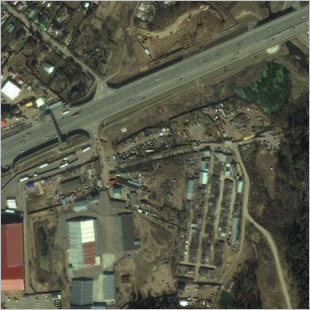 Satellite images become outdated over time: an empty lot might appear where a newly built-up territory is, a demolished building might display where a new one has been built, etc. 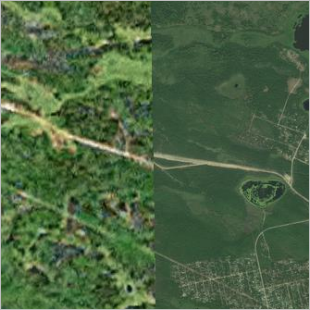 If you're in a situation where items that you drew or edited don't match satellite images, (for example, if the image is like the one on the left that is already seriously outdated), you must include a comment explaining why your work does not match the satellite images. 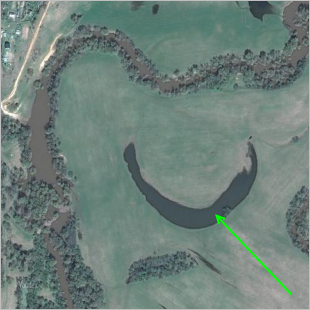 If territories that you want to map are covered with clouds in the available images, you can draw the item you're interested in schematically by relying on images of the surrounding areas. 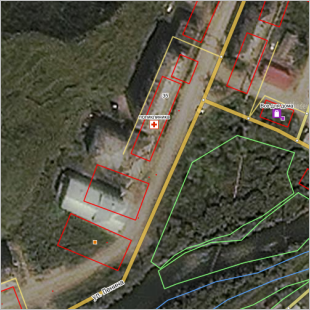 Then, when a detailed image is available of the area you drew, you can correct your previous work. However, it's better to refrain from drawing small map items that are completely hidden by clouds. 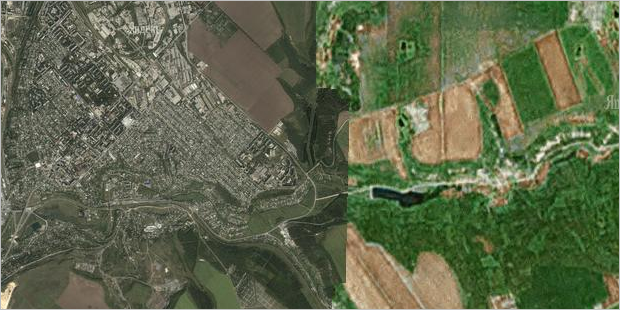 Drawing satellite images of territories covered by snow (see the images on the left) has its own challenges. A lot depends on how deep the snowfall was and if the images differ from images of the same areas that were taken when there was no snow (see the images on the right). Sometimes snow makes it easier to identify a map item. 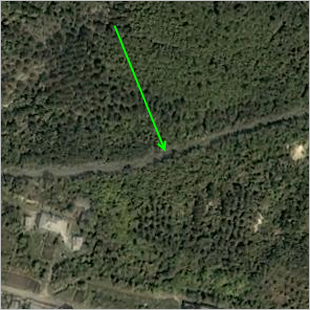 For example, rivers and roads that are usually masked by vegetation may become more distinct. Other times though, snow makes it harder to identify items: trees and other vegetation are hidden, for example (see the pair of images on top). If the territory that you want to map is covered by snow in the available images, you can still map them if you account for the ways that snow changes a landscape. 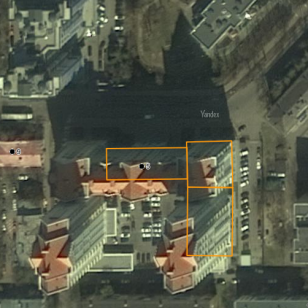 When drawing the edges of a building, it's important to remember that satellite images are typically taken at an angle to the ground (rather than from directly over the item). 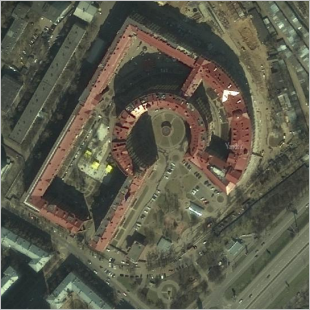 This is why the roof outline will not match the footprint (i.e. 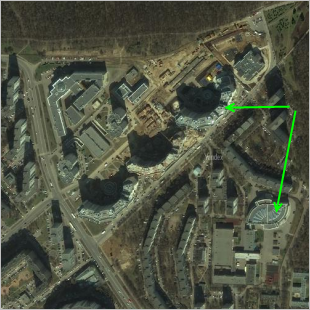 the outline of the building's foundation) in images. Make sure you are drawing the footprint. 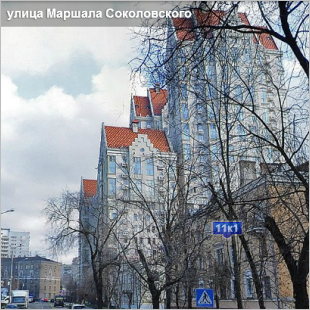 The higher the building, the greater this discrepancy. 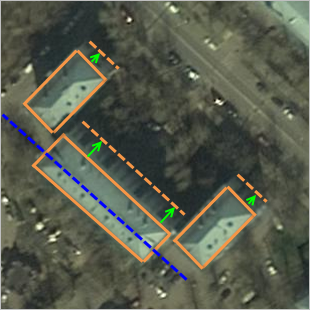 If you draw the building based on the roof contour, then there may be conflicting map data between the building outline and the courtyard driveway or street that it intersects with. 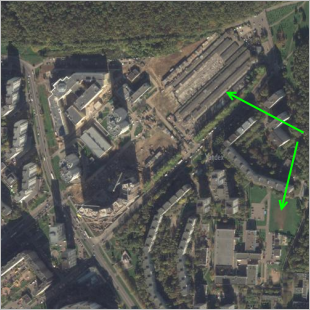 To avoid this, the following basic rule must be followed: A building should always be drawn according to its footprint (For more building drawing details, see Section 3.4.1. Rules for drawing buildings. To make sure that buildings with sections of varying heights display properly on the map, give each section gets its own footprint. 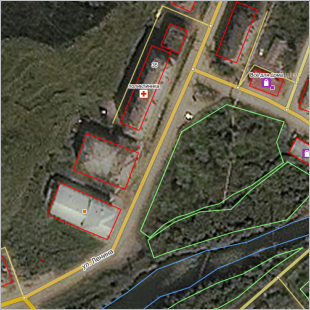 In rural areas, buildings tend to be low-rise and there is less of a problem with outlines being displaced. 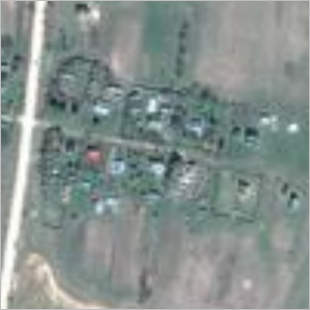 Rural areas present their own challenges though, as building contours are often small and less detailed on satellite images. 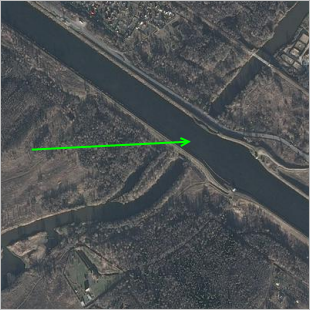 In difficult situations like these, you can distinguish roads from other linear items such as rivers based on if they are linked to a road network (rather than a hydrographic network). 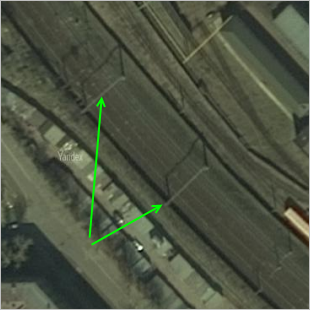 When you study the connection between the item in question and its surroundings, the item's identity should become clear (for example, if a connected item has been definitively identified as a motorway, then it follows logically that the item in question is a road). 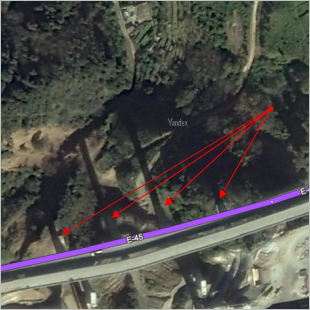 The blue arrows indicate an intersection between map items. 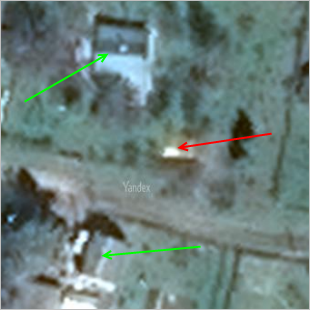 A road's significance on Yandex Map Editor depends on the role it plays in the road network. 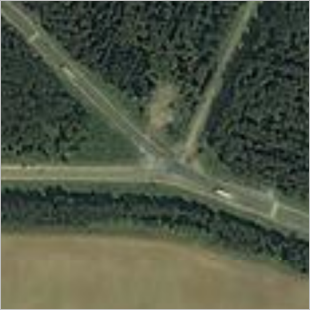 This role is not only determined by features of the road itself (its surface type, number of lanes, etc. 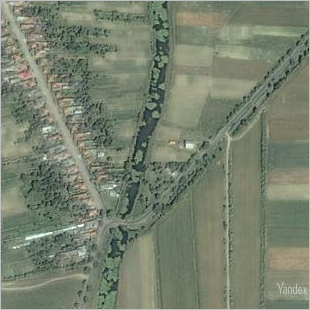 ), but also the types of localities or parts of localities that the road joins. 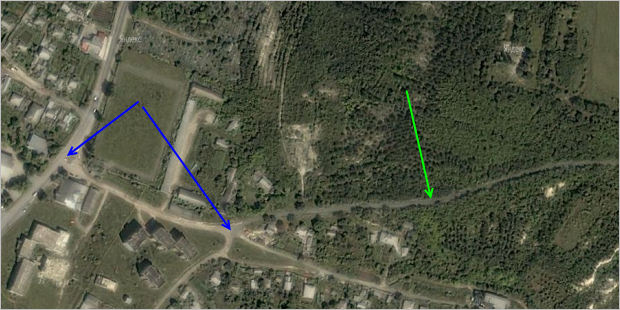 A narrow road with one driving lane may be more significant than a road with two lanes if the former connects several localities, whereas the latter only connects neighboring parts of the same city. For more information, see Section 3.3.3. 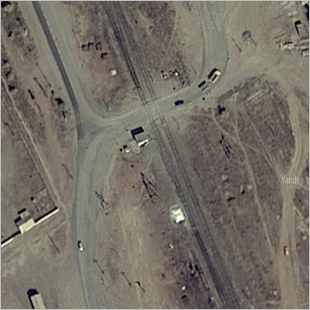 Rules for attributing roads. 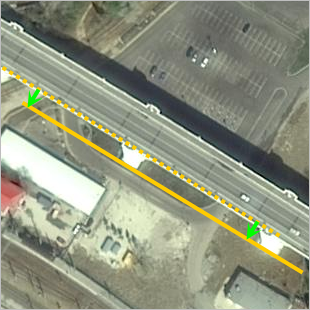 As with buildings, when you draw bridges you must keep in mind that satellite images are taken at an angle to the ground (rather than from directly above the map item), so there may be a discrepancy between how the surface of a bridge above ground level looks in the image and the actual outline you want to draw. Furthermore, the higher the bridge, the greater this discrepancy. 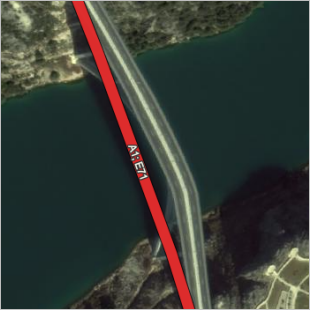 When mapping bridges, make sure to account for this discrepancy. 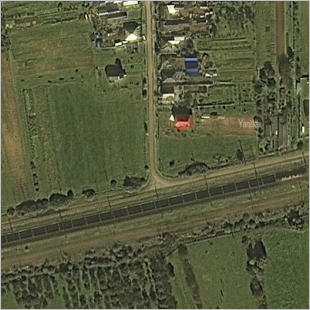 Otherwise a road that runs over a dislocated bridge may be drawn where a different motorway should be, which ruins the drawing of that road network. 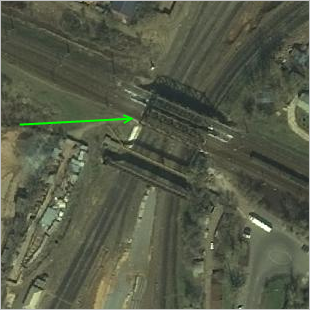 Bridges that intersect a valley may remain on the same plane as other sections of that same road (i.e. not rising above road level). 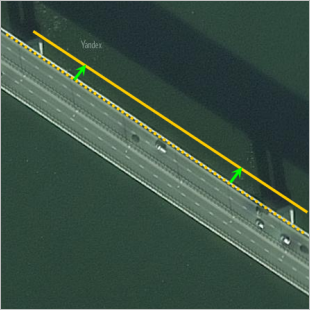 In these cases, you may not need to shift the road line in relation to the bridge floor. 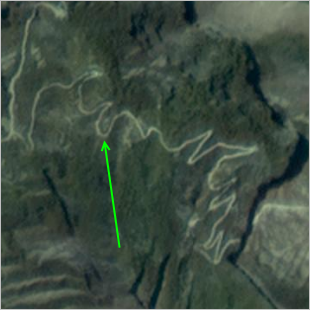 An important characteristic of rivers is meanders (river bends). 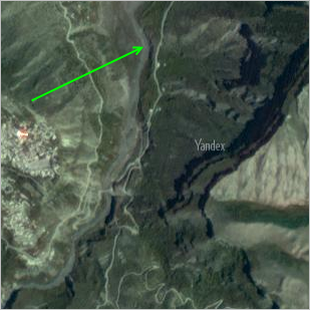 Meanders that separate off from the riverbed often form oxbow lakes (which are distinguished by their arched outlines). 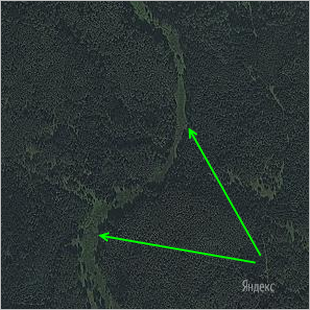 If you see oxbow lakes, this is a clear sign that a river is near. 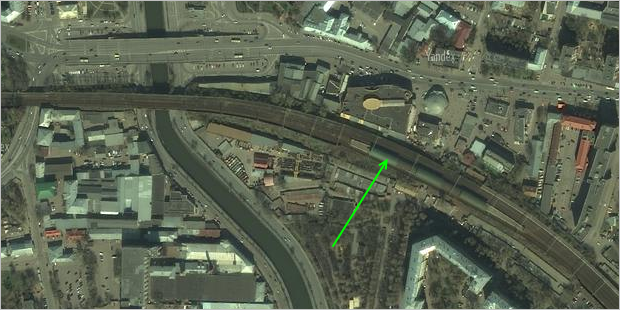 Lines for rivers should be drawn down the middle of riverbanks. 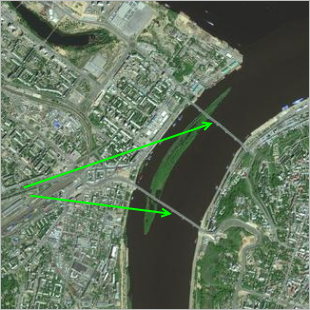 If a river is wide and is drawn using both linear and polygonal items, then the lines you draw should trace the river's shores (not the lines of tree canopies hanging over the water). 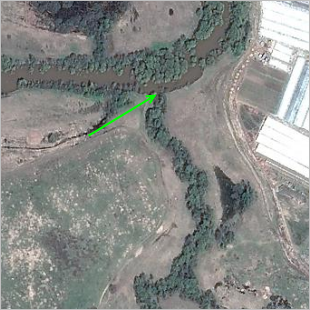 Rivers that form a hydrographic network in reality should also form a network on the map.